Rights aren’t something many writers give much thought to. In the rush of elation of at a publisher’s interest, they’re frequently overlooked. But they are important, especially if you ever hope to make a living from your writing. My first novel, Telling Stories, won the Reed / North & South Fiction Award in 1995 for best unpublished novel. It was published the following year under the Secker & Warburg imprint of Reed Publishing. Two years later it went out of print and, boom, that would have been that – if I had signed away all my rights. Publishing contracts are typically “for the term of copyright”, which is to say your life plus 50 years. (It’s 70 in the US.) What that means is that you no longer own the work. It might have your name on the cover, but from a legal perspective, it belongs to someone else, usually your publisher. If someone wants to make a film or TV series from your book, publish a Czech edition or turn it into a video game, they ask the copyright holder’s permission, not yours. And they pay the copyright holder, not you – although you might get a small percentage of the deal. When I was offered a contract for the book way back when, I requested a few minor changes. (What? you may ask. How dare you! 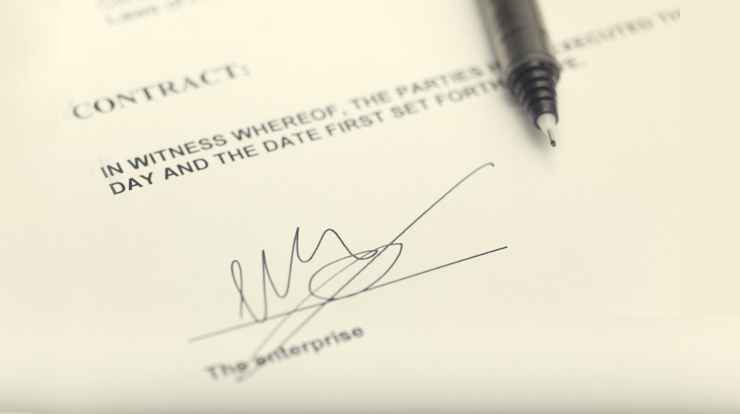 I dared because contracts should be mutually beneficial. And if you don’t ask, you don’t get.) One of those changes was to replace the “for the term of copyright” clause with “for a term of ten years” – with a similar right of renewal if agreed by both parties. Telling Stories went out of print in 1998. The rights came back to me in 2006, but I didn’t really do anything with them till 2014 when I re-released the book in both print and epub versions. In the intervening years I earned precisely $0 from sales – simply because you couldn’t buy it any more – but since then it has at least for the odd cup of coffee and doughnut. Then, in June this year, my right to publish my own book was challenged. or other copyright holder has his or her books sold by anyone else. your publishing rights within four days. Sales of the book had been suspended pending review. The email went on to detail acceptable forms of documentation that would confirm my right to re-release it. Fortunately, finding that documentation wasn’t a problem. I still had a copy of the original contract, along with the associated correspondence, and was able to submit scanned copies within the specified timeframe. But four days is no time at all. What if I’d been on holiday at the time, or had to track down a duplicate copy of the contract from my long-defunct publisher? It could have taken months! If I hadn’t negotiated the original contract, PRH would now still own the print rights, foreign publication rights, film and TV rights, etc. to Telling Stories. But not, interestingly, the ebook or audiobook rights because, back in 1995, they weren’t “a thing” and my contract didn’t have a “plus the rights to any other technology not yet invented” clause that most modern contracts have. So all’s well that ends, etc., but I’m still wondering how I would have got on if I hadn’t had a copy of that paperwork. Remember, this is from a largely pre-digital era. Presumably, there’s a warehouse somewhere containing stacks of mouldering contracts that someone would have had to search through. (At whose cost?) And what if they hadn’t even been able to locate it? 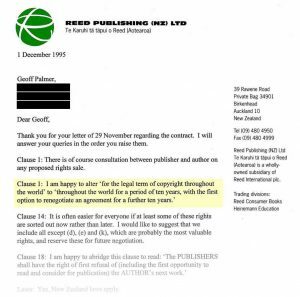 Would the fact that Reed first published the book almost 25 years ago lead to the assumption that I’d signed a standard contract and PRH were the book’s real owners? Interesting questions. I don’t know the answers, but I do know one thing: Keep copies of all important documents, especially contracts, because, in publishing, they’ll outlive you by 50 (or 70) years! UPDATE: (14 November 2018). One further question remained: why are PRH checking to see if 20 year-old books have been re-published? It must be costing staff time and effort for (apparently) no return, so why bother? I think I’ve found the answer. See A Small Mystery: Solved.